Celebrating the life of Bennie Robert Cosby Jr.
Be the first to share your favorite memory, photo or story of Bennie . This memorial page is dedicated for family, friends and future generations to celebrate the life of their loved one. 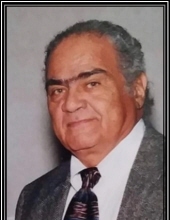 Obituary for Bennie Robert Cosby Jr.
Bennie Robert Cosby Jr., 81, passed away peacefully on Friday, February 8th, 2019 at Reid Health Hospital. He was a member of First Baptist Church Family Life Center, New Castle, IN. He was retired after many years of being self-employed as a Home Improvement Contractor. A native of Richmond, Indiana, Bennie graduated from Richmond High School in 1955. After graduation, Benny enlisted in the United States Army where he was stationed in Germany after completing basic training. He leaves to cherish his memory his wife, Phyllis Cosby of New Castle, two daughters, April Hoosier-Cosby of Richmond, Amy (Corey) Chamberlain of Anderson, five sons, Guy Cosby (Lisa) of Fowler, IN, Brian (Meg) Cosby of Speedway, IN, Scott (Veronica) Cosby of Richmond, IN, Alex (Sharon) Cosby of Louisville, KY, and Brandon (Gayle) Cosby of Indianapolis. Additionally, Bennie was a proud Grandfather to 25 grandchildren, 3 great-grandchildren, and 1 great-great-grandchild. He loved all of his grandchildren but had a particularly special relationship with his oldest grandson Storm. There were also special relationships with his niece and nephew Bruce and Teresa Smith. He was preceded in death by his parent's Terrace and Bennie Robert Cosby Sr., his first wife Sandra Beatrice Cosby, his daughter Teresa Lynn Cosby, grand-daughter Fala Nicole Hooiser and his son Jason Mark Cosby. The funeral service will be Thursday, February 14, 2019, at First Baptist Church Family Life Center of New Castle. The calling will be from 10:30 am to 12:00 pm with the Service immediately following at 12:00 pm. Military rites will be conducted by the American Legion and VFW. Arrangements have been entrusted to Macer-Hall Funeral Home of New Castle, IN. To send flowers or a remembrance gift to the family of Bennie Robert Cosby Jr., please visit our Tribute Store. "Email Address" would like to share the life celebration of Bennie Robert Cosby Jr.. Click on the "link" to go to share a favorite memory or leave a condolence message for the family.